To complement our range of Cranes we also offer almost every type of Lifting Equipment, Gear and 'Under The Hook' Accessories to assist with the rigging and lifting of loads up to 600 Tonnes. Cranes-UK boast huge ranges of high quality industrial Lifting Equipment as well as economy ranges to suit every pocket. Hoists, Lifting Slings, Magnets, Chains, Clamps, Shackles, Jacks and much more are supplied complete with certificates of conformity and all products feature individual traceability right back to the manufacturing plant to ensure peace of mind when Lifting with Gear supplied by Cranes-UK. Lifting Equipment is designed to be used in applications where the load is simply too heavy to be lifted by hand or where a load is to be regularly lifted and would otherwise cause strain on the person if frequently lifted by hand. We provide a solution to nearly every industrial, domestic and commercial application with specialist equipment that has been designed with a particular application in mind such as gear designed for use in explosive enviroments or equipment designed for use in confined spaces. Making light work of heavy situations, Lifting Gear increases productivity and provides a safe and healthy alternative to lifting by hand. Not only do we just supply, our services extend to inspection, testing and certification of all types and sizes of Lifting Gear and Equipment. 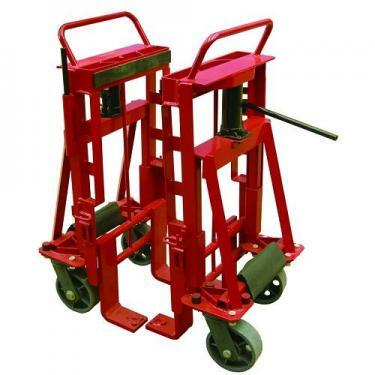 This hydraulic machine mover features a heavy-duty design and can lift larger loads, up to a capacity of 3,600kg. LES hydraulic machine movers are simple to use, as you can slide them underneath the load, or lift the load on by hand. They come with 5m ratchet straps so that you can secure the load before starting to wheel the machine mover. You will be able to lift a variety of heavy loads, including crates, machinery and containers.